The controversy around IR35 continues to affect a number of industries, but the complexity of this regulation has created particular confusion in the IT sector, with a number of cases taken to the high courts. Some suggest it is the nature of the providing IT consultancy that brings HMRC’s attention, whilst others suggest that the guide provided by HMRC is exactly just that, a guide rather than a set of rules, meaning that some of the required criteria tends to have more weight than others depending on each case. The first appeal against HMRC in regards to IR35 took place in 2001, just over a year after the law was first introduced. Known as Battersby vs Campbell, the case involved an IT consultant who worked for a bank for seven years through his limited company, first under a six month contract and then under a number of 12 month contracts. Mr Battersby eventually started reporting to a manager and had other people working underneath who were hired directly by the bank. The consultant was also paid by the hour, used the company’s equipment and had to request permission for any absences. At this point in 2001, he was offered a permanent position which he accepted. HMRC determined therefore that the income from the previous six months should classify as earnings rather than dividends. It sounds an easy case and an obvious one for someone with knowledge on IR35 implications, however, there is also another side to the story: Mr Battersby had no rights to sick pay, private healthcare or holiday pay prior to becoming a permanent employee, he had to renew his contract year after year and was paying £1000 in accountancy fees per year to manage his own book keeping all of which are basic criteria to fall outside of scope of IR35. The consultant also asserted that it is common in the IT industry to hire freelancing contractors because they can be laid off without severance pay. This was unfortunately not enough for the courts and HMRC won the case. There has been other cases ruled in HMRC’s favour since, such as the famous case of Dragonfly Consultancy in 2007, in which consultant Jon Bessel was left with a bill of £100,000 in taxes after the high court dismissed his appeal on the grounds that he had become part and parcel of the AA – the organisation he was working for at the time – due to being considered a team member and having a manager to report to, despite having a contract with a right to substitution and paying for his own equipment and training. It seems however, that over time, contractors and companies have come to terms with this law. From 2009 to 2018 courts have been ruling in favour of IT consultants, consistently finding that they are genuine contractors. It was only last year that the High Court finally ruled in HMRC’s favour. The failed appeal of journalist and broadcaster Christa Ackroyd is the last recorded case won by HMRC. Mrs Ackroyd was requested to pay over £400,000 in taxes following a suggestion from the BBC that she create a limited company to avoid BBC’s liability of PAYE and NI taxes, despite the fact she had a seven year fixed contract. The court emphasized Mrs Ackroyd had done nothing wrong and the BBC eventually apologised for having encouraged these practices but the taxes still needed to be paid. More recently, TV presenter Lorraine Kelly has won her case against HMRC after proving she is not an employee of ITV but rather an entertainer who performs the role of a friendly and charismatic person for their shows. Mrs Kelly was also able to prove she was not receiving sick pay or any other benefits from ITV. When it comes to IT consultants, all cases taken to court have been ruled in their favour meaning IT consultants have continued to prove to HMRC they are genuine contractors. ECR Consulting, MBF Design Services and Jensal Software are amongst this list. It is important to highlight that IR35 was created with the purpose of stopping “disguised employees” from avoiding paying tax and National Insurance, but also to avoid inequality in the rights between two people performing the same job, therefore the most important thing to do is to ensure that your contract and your working practices are aligned. As a contractor, you might receive a letter titled “Check of employer records” at some point. This is an IR35 enquiry letter that HMRC sends out to contractors. 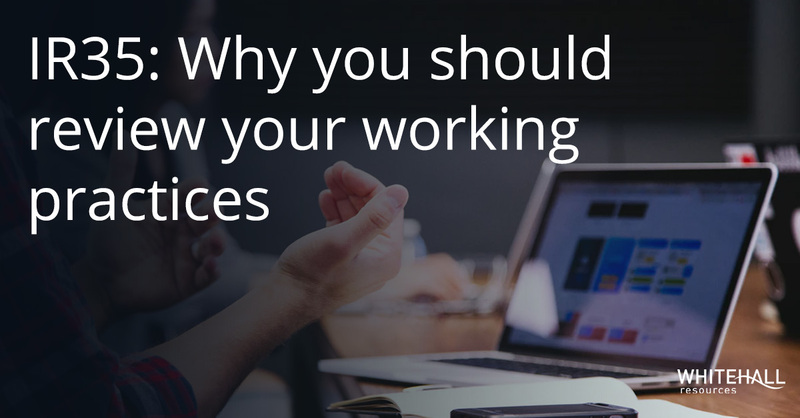 You will recognise it because it will ask you to provide a breakdown of the income reported in your limited company accounts and a copy of the contracts that resulted in that income. The letter will also request clarification on whether you believe IR35 applies to your company or not and why. This letter is an opportunity to explain your working practices and provide supporting contracts to demonstrate that IR35 does not apply to your services. You may also have to attend to a face to face meeting to provide further information. Should HMRC be happy with the information provided, the investigation will be closed. How can I prepare for an IR35 enquiry letter? Why do I need to review my contracts? The main reason to be prepared is to be able to prove you are not a “disguised employee”. There have been cases such as the ones mentioned above, in which either the contract or the working practices do not reflect a relationship between a client and a contractor, but rather that of a company and an employee. You should therefore ensure that your contract, whether it has been signed directly with a client or via an agency is clear about your relationship with the end client. The contractor provides independent services and is not under the supervision, direction and control of the client. The contractor has a genuine unfettered right of substitution. The contractor is responsible for the delivery of the services and controls how and when they undertake the services, as long as they meet client specific targets or completion dates. The contractor is seen to have a financial risk, i.e. are responsible for making good any defective work and maintaining appropriate insurances. The contractor provides the main tools, equipment and materials required to perform the services (except where the hirer has a business-critical requirement for the contractor to utilise equipment, i.e. for security, data protection or safety). More importantly, contractors should always ensure that the working practices mirror the contract. If a contractor has similar working conditions, responsibilities and control as a client employee, they are more likely to be caught inside IR35, regardless of what the contract says. Learn more about IR35 and the new changes taking place in 2020 : Am I a PAYE or an off-payroll contractor?